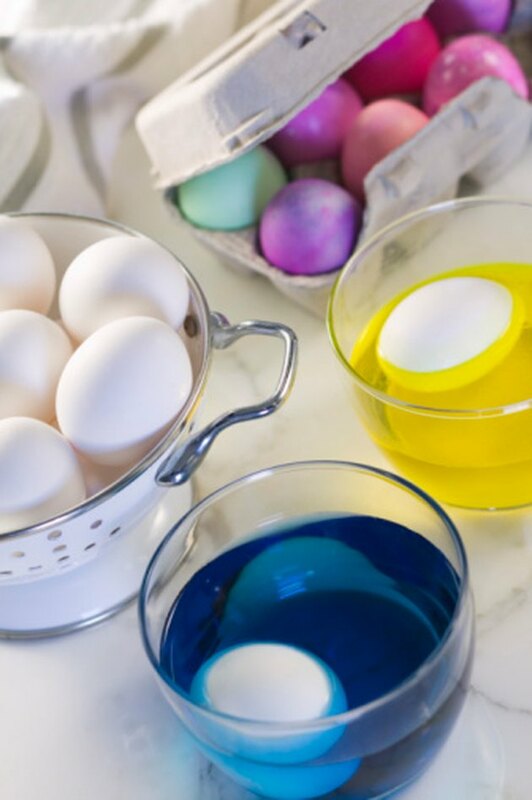 Food coloring is a useful way to transform the color of icing, Easter eggs and a variety of other food items. However, it can be messy to use and will stain anything that it touches including countertops. If the food coloring sits on the counter for even one to two minutes, a stain often occurs. Removing stubborn food coloring stains from a counter requires the use of a chemical solvent. Remove food coloring stains when they are fresh. Wipe the counter with a damp sponge to remove as much of the food coloring stain as possible. Fill a bowl with 2 cups of warm water, 1 tsp. of liquid dish soap and 1 tbsp. of ammonia. Insert the sponge into the mixture and wring it out only enough so that it is not dripping. Apply the liquid to the food coloring stain until it pools up slightly. Allow the mixture to sit for five to 10 seconds and then wipe it up with the sponge. Examine the counter to see if the food coloring stain remains. If it does, repeat the procedure until the stain is completely gone. Afterward, rinse the counter with clean water and wipe dry with a cloth.